NEW YORK (AP) LeBron James got shoved by the Knicks and then benched by his coach. Neither could keep him down for good. 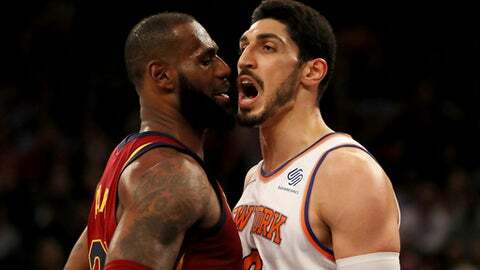 James had 23 points, 12 assists and nine rebounds, Kyle Korver scored 19 of his 21 points in the fourth quarter to spark a huge comeback, and the Cleveland Cavaliers beat New York 104-101 on Monday night. James also had a technical foul after a first-quarter altercation with Frank Ntilikina and Enes Kanter, which seemed to charge up the Knicks. But he didn’t lose his poise then or midway through the third quarter, when Tyronn Lue yanked the five starters with the Knicks on their way to a 23-point lead. He did, hitting two of the Cavaliers’ nine 3-pointers in the fourth after they made just seven through three quarters and helping the Cavs charge back for their eighth straight victory at Madison Square Garden. Cleveland outscored New York 43-25 in the fourth, making more 3s than the Knicks had baskets (8). But the turnaround started late in the third with the second unit in. Tim Hardaway Jr. had 28 points and 10 rebounds, and Kanter added 20 points and 16 boards. But Kristaps Porzingis shot only 7 for 21 while scoring 20 points as the Knicks blew their chance to beat the Cavs for the second time this season. The game was just two days after James, following a victory in Dallas, said Mavericks rookie Dennis Smith Jr. should be a Knick. The Knicks passed on Smith in the draft, taking Ntilikina one spot earlier at No. 8. James said he meant it as a shot at former president Phil Jackson, and he was angry that he thought Kanter overreacted in his defense of Ntilikina. So it wasn’t surprising they were involved in an altercation late in the first quarter. James dunked and then wouldn’t move out of the way as Ntilikina tried to take the ball back to the baseline to throw it in. Ntilikina pushed James, who then exchanged words with Kanter after he ran in. James shoved Kanter, and both were given technical fouls. ”I don’t care … what you call yourself. King, Queen, Princess, whatever you are. You know what, we’re going to fight and nobody out there (is) going to punk us,” Kanter said. The Knicks got hot after that, hitting the Cavs with a 15-0 burst early in the second to open a 47-31 lead. Ntilikina and Hardaway both stole the ball from James during the run. Cleveland made a brief run early in the third before New York extended it back to 17, when Lue made his line change. Korver said even then he was still thinking the Cavs could win. Cavaliers: Derrick Rose, who played for the Knicks last season, remained out with a sprained left ankle. … Cleveland started 2 for 15 behind the arc. Knicks: Former Knicks stars Bernard King and Latrell Sprewell were at the game. … G Ron Baker was inactive, with coach Jeff Hornacek saying he hurt his shoulder playing for the Knicks’ G League team over the weekend. Cavs players took the subway back to their hotel after their morning shootaround at MSG, rather than sit in traffic on the bus. James, in a video posted by the NBA , said it was his first time taking the subway in New York. ”When in Rome,” Korver said. Joakim Noah was eligible to play after the completion of his 20-game suspension for violating the NBA’s anti-drug policy last season, but the Knicks kept him on the inactive list. Hornacek said Noah is in shape – he was allowed to practice during his suspension – and a valued member of the team, but the Knicks’ center tandem of Kanter and Kyle O’Quinn has been playing well. Cavaliers: Visit Charlotte on Wednesday. Knicks: Host Utah on Wednesday.